Monkees guitar pick earrings - *ON SALE* the back of the earrings has discolored a bit, turning orange in color. For that reason this item is now at a reduced price. The front of the earrings/the images of the Monkees are unaltered. Davy and Mike in black and white, made from the album "More of The Monkees." 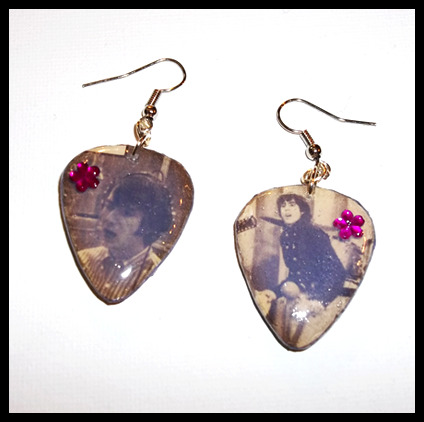 Monkees guitar pick earrings colorful stripes, jewels, flower gems and are sealed with epoxy resin and Mod Podge. Fish hook style earrings.